Every week, I play a lot of Steam games. Here’s what I think of a few I didn’t get around to writing up. I was really hoping I’d like this one more. It’s a game about swinging and soaring from the person who designed the web-slinging stuff in PS2/Xbox/Gamecube Movie Game That Was Actually Pretty Alright Spider-Man 2. So far, though, Energy Hook just feels... off. The physics are all over the place, and there’s very little collision detection. I can’t get into it. It is, however, still in Early Access. Fingers crossed for some serious improvement. You might remember that I’m somewhat fond of mosh pits, so this game could’ve been right up my alley. Unfortunately, “mosh pit” is really more of a theme than a gameplay element here. Ubermosh is basically an arcade-y twin-stick shooter with a kick-you-in-the-teeth punk soundtrack and a cool bullet-cutting mechanic. It’s fun, and it feels great. There’s not much meat on its bones, though. 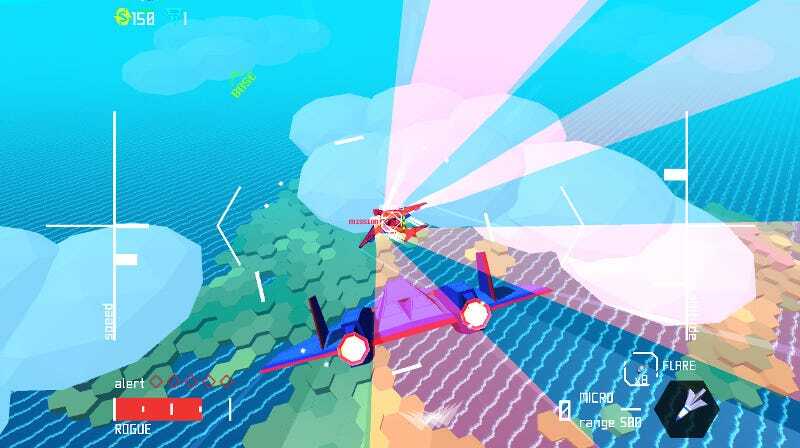 It’s a roguelike-like, but in the sky. Would that all video game titles could be so straightforward. It’s got a stylish retro anime-style look, a nice sense of speed, and swishy sound effects. Planes feel less sim-y and more like something out of Ace Combat or Crimson Skies. It’s fun! Most of my deaths came from botched landings, because I’m incompetent like that. I didn’t get around to playing that many games this week because I’ve been pouring all my time and attention into a big feature for next week—and also being hilariously ill. I’m hoping to make this a weekly thing, though, probably with more games. Now’s the part where I open the floor to you. What Steam games did you play this week? Did you love them? Hate them? Have complicated feelings about them that you can only express through a soulful acoustic guitar ballad (that you’ll remix into a monster EDM club hit)? Sound off! Together, perhaps we will one day have cursory knowledge of ALL STEAM GAMES.